You can use a Visa debit card to make purchases without using cash or a check while also avoiding incurring interest charges as a result of your purchase. These debit cards can be used anywhere Visa is accepted. Visa cards are also widely accepted for recurring automatic payments, such as for utilities and gym memberships. This makes these debit cards quite convenient. Check with your financial institution to find out what you need to do to request a traditional Visa debit card, also called a check card. You will need a checking account in order to qualify for a traditional debit card since the funds you spend will be taken out of this account. If you don't have a checking account, you can look into getting a prepaid debit card instead. One feature exclusive to this card is the Visa Ready program. It allows you to load money onto your card at any merchant that features the Visa Ready logo at checkout. These merchants include 7-Eleven, Safeway, Carrs, Tom Thumb and several others, nationwide. If you have a bank account but still want a prepaid card, you can also fund your card with direct deposit. You can use this card anywhere the traditional Visa debit card is accepted. The only difference is that you are limited to the funds loaded on the card at the time. It's good for in-store and online purchases and for any bills that accept credit card payments, all over the world. Get cash at ATMs with this card by selecting "checking" as your withdrawal option. Note that this card must be activated before you use it, and you will need to put money on it immediately. If you'd like to give a debit card to someone else, the Visa prepaid gift card is also available. Find a retailer near you by visiting the official Visa website. Swipe the debit card just as you would a Visa credit card. You will be asked to either enter a personal identification number (PIN) or sign for your purchase, and the amount of the purchase will be debited from your checking account or the amount you have loaded on the card. No line of credit is attached to this card unless the issuing financial institution offers lines of credit or overdraft protection and you have requested to have one linked to your card. Many merchants give cardholders the opportunity to decide whether to specify the purchase as being made with a debit card or credit card. When using your Visa debit card, you can choose either option. After specifying the purchase as a debit you will likely be required to enter your PIN into a keypad. If you specify a credit purchase, a signature is usually required. However, if your purchase is below a certain dollar amount, you may be able to just swipe and go. 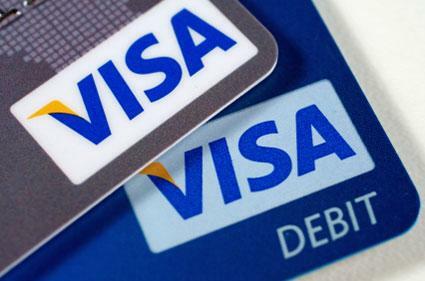 Which option should you choose when using your debit card featuring the Visa logo? Check with your card's issuer to find out if there are any fees attached to using one over the other. If there are no fees regardless of the method you choose, it comes down to personal preference. Using a PIN can be a quicker method, but signing for your purchase will make it impossible for the person behind you in line to sneak a peek at you inputting your PIN. Problems with the credit card processing system may delay the request for funds. Some merchants, such as restaurants or gas stations, may preauthorize an amount to be deducted from your account, but the actual amount will not be deducted from your account for one or two business days. For more information regarding authorized holds on debit cards, speak to a representative at the company that issued your card.